LIKE an ageing fighter, the sport of boxing is still standing . . . just. The hits are few and far between and one senses a well-placed blow could lead to a knockout. It remains an Olympic sport, controversially adding women's divisions to the London Games in 2012 but beyond the occasional buzz created by Danny Green and Anthony Mundine, boxing in Australia is fighting with one arm tied behind its back, bogged down by too many dull, meaningless fights. Meanwhile, a bold, young sport has it pinned to the canvas, with one hand cocked, the other holding a fistful of dollars. Mixed martial arts is one of the fastest-growing sports in the world. Aggressively pushed by US-based company Ultimate Fighting Championship (UFC), this brutal blend of boxing, wrestling, kick boxing, karate and jiujitsu claims to sit comfortably in the top four most popular sports in the US based on revenue, TV ratings and ticket sales. Only American football consistently beats its US ratings -- and now Australia is in its sights. In 2001 Las Vegas casino moguls Frank and Lorenzo Fertitta bought the UFC for $US2 million. Eight years later it is estimated to be worth more than a $US1 billion and growing. That's a war chest even AFL boss Andrew Demetriou would envy. And while Australia's football codes are moving away from their more savage pasts in a bid to extend their family appeal, the UFC is stepping into the breach and thriving. Unapologetically, this is bloodsport. Unequivocally, this is why many people like it. Undoubtedly, boxing is being left in its wake. The UFC train rolled into Sydney last week to promote its first live event on Australian shores. UFC 110, held on February 21, sold out within hours -- the second fastest sell-out in the UFC organisation's history. It will set a new revenue record for a sporting event held at Sydney's Acer Arena, the same venue that played host to the blink-and-you'll-miss-it Danny Green-Roy Jones Jr fight on December 2. It will be among the biggest revenue generators in the history of Acer Arena. Not a single fighter had been announced on the card when tickets went on sale, not a single dollar was spent on advertising. Already pay-per-view channel Main Event is favouring UFC over boxing. When Floyd Mayweather made his comeback against Juan Manuel Marquez on September 19, it was a UFC event that was shown live instead. Coverage of the boxing was pushed back a day. The Anthony Mundine-Danny Green super fight in 2006 remains the No 1 pay-per-view event in Australian TV history. Outside that, the UFC dominates. Boxing promoters around the country are rightfully worried. Angelo Hyder, the man who trains and manages Green, is the first to admit he holds fears for boxing's place on Australia's sporting landscape given the seemingly unstoppable rise of a sport that boasts a strong central leadership and a product that draws young men like flies to blood. The UFC controls every fight, every one of the lucrative title belts. It promotes its fight nights as packages, rather than just one big bout preceded by a bunch of retired footballers or bloated no-names swinging hopelessly at each other. Local MMA events are sprouting up in clubs around the nation, replacing what would have been nights of amateur boxing. "Boxing should be very worried and concerned at the growth and crowd appeal of UFC," Hyder told The Australian. "Boxing can take a leaf out of UFC's book by putting on more exciting matches together. "In UFC one fighter is told `You are fighting him', that's it. "You have to remember UFC is a concept, whereas boxing in this country has to fall back on is on the back of a Danny Green, Vic Darchinyan or an Anthony Mundine. Once they get beat, people quickly drop off them." The UFC is certainly ambitious enough to expand beyond the niche status it currently occupies in this country. "Obviously you see the World Cup and you see soccer or football as being huge. "It's pretty bodacious but we do believe there will come a time . . . when the world will want to stop and watch and wonder who won a UFC fight, the same way they did when Ali fought Foreman. "We certainly don't strive to be niche, we definitely want to be mainstream. But some would argue that boxing never became mainstream. "Our aspirations are greater than that. Hopefully we get knitted into the fabric of the sports community." There are plenty who will cringe at that suggestion. Mixed martial arts has a chequered past. The first UFC events in the early 1990s were no-holds-barred free-for-alls, with no weight divisions. Fans would have to run the gauntlet of protesters outside the stadiums. It was famously labelled "human cockfighting" by US senator John McCain. State governments refused to sanction fights and TV stations shirked at the brutality. As a reult, the sport was forced to change, implementing a long list of rules banning things such as eye-gouging and groin attacks. 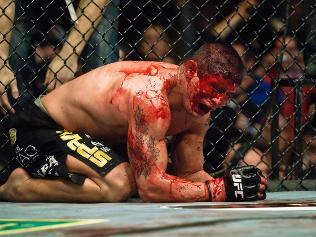 Ultimate fighting often sees fighters covered in blood as raging rivals "ground and pound" them until they can take no more or the referee is forced to intervene. Other fighters look to twist limbs into painful positions to force their rival to "tap out". It's not for the faint of heart but it's highly skilful and it has struck a chord -- particularly with the key 18-34 male demographic. It's not just the fighters but the type of fighting that seems to hold the most appeal. Short, sharp bouts no longer than 15 minutes encourage fighters to attack and usually produce a clear winner. Hyder can only look on jealously. "There's too many blokes like an Anthony Mundine at the moment who are bringing over poor opponents and he's not knocking them out," he said. "That's hurting the sport of boxing. It's not only hurting the money he's generating. I'm quite surprised that he's doing that. "If I was a promoter solely in the sport to make money, I would have started putting on UFC fights 10 years ago. I would have liked to have got in early. But it's not what I do. I respect the money UFC is making." Zelaznik says boxing does itself no favours. "Boxing has declined for myriad reasons, none of which have anything to do with the UFC," he said. "When you look at boxing and how fragmented the titles are, the lack of consistent television coverage, the promoters being more interested in a one-off than building something long-term -- those are the kinds of things we developed in our business plan. "We went in an opposite direction, which was to put on compelling fights top to bottom. "There's nothing malicious or intentional that we are doing as a company to harm boxing. Boxing's demographic is just getting older and this new, young demographic -- you can call it the ADD (attention deficit disorder) generation if you want -- they want something now and immediate. "The UFC, with the format of the fights and the styles of fighters, they attract that interest." UFC 110 will go free-to-air on February 21 via the One HD channel. Live events in Australia have previously only been the domain of pay-per-view. High-profile UFC president Dana White sees the tactic as "dropping the MMA bomb" then watching it spread. Some of the UFC's best fighters will be on show, including three Australian fighters. American fighter Joe "Daddy" Stevenson, a fast-talking and cheeky crowd favourite inside the caged octagon, says MMA's appeal is obvious. "Just watch and you'll see," he said. "You don't have to speak the language, you don't have to really know the rules, you don't have to have an understanding of who we are. Everyone understands about instinct, everyone understands about survival." "Boxing is here to stay"
The above article simply describes in a ridiculous manner a comparison between a brutal competition way of demoralization of so called sportsmen and the noble art of boxing. It is very well known why participants get involved in this type of competition and the answer is simply in the fact that they don't measure up to compete and attain the glory that is gained by fighters in the centuries old sport of boxing.